The question that Paul set before the ancient church in Corinth -- Do you not recognize that Jesus Christ is in and among you? (2 Cor 13:5) -- remains a critical question for the church today. 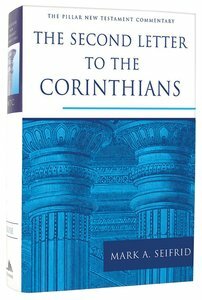 This commentary by Mark Seifrid offers a unified reading of 2 Corinthians, which has often been regarded as a composite of excerpts and fragments, as Seifrid seeks to hear Paul's message afresh and communicate it to our time. "If you value detailed, sustained exegesis coupled with deep theological analysis, then this commentary is for you. This is Mark Seifrid at his very best -- grappling intensely and respectfully with the content and progression of St. Paul's thought, and bringing it alive for the reader today. . . . Kudos!" "Mark Seifrid takes a distinctive approach to the commentator's task: rather than cataloging and evaluating the opinions of modern scholars, he chooses to focus on his own fresh, stimulating, and very definite interpretation of the letter, its theology, and its significance for fundamental issues of hermeneutics." "Seifrid brings extraordinary erudition, exegetical precision, and astute theological reflection to the interpretation of this poignant letter. He makes Paul's parental love for his problem church come alive and presents his word of the cross so that it also speaks to present-day realities. . . . An outstanding addition to an excellent commentary series." "Mark Seifrid has given us here a model commentary on Paul's most passionate, intensely personal letter. Refusing to dice up 2 Corinthians into disparate fragments, this volume presents a coherent if afflicted and sometimes distraught apostle committed to the fulfillment of the mission he has received from the risen Christ. At once a superb work of erudition and devotion." About "The Second Letter to the Corinthians (Pillar New Testament Commentary Series)"
Mark A. Seifrid (Ph.D., Princeton Theological Seminary) is the Mildred and Ernest Hogan Professor of New Testament Interpretation at Southern Baptist Theological Seminary, Wilmore, KY. Before joining the Southern faculty, Dr. Seifrid served as Visiting Lecturer at Wheaton College and at Trinity Evangelical Divinity School. Along with several articles, he is the author of Justification by Faith: The Origin and Development of a Central Pauline, Christ Our Righteousness and co-editor of two volumes with Peter T. O'Brien and D.A Carson Justification and Variegated Nomism: The Complexities of Second Temple Judaism and Justification and Variegated Nomism: The Paradoxes of Paul. He is a member of the Society of New Testament Studies and the Society of Biblical Literature. He previously served as a campus minister with the Navigators at the University of Michigan and the University of Illinois. This careful, sometimes innovative, mid-level commentary touches on an astonishingly wide swath of important, sensitive issues - theological and pastoral - that have urgent resonances in twenty-first-century life. Roy Ciampa and Brian Rosner reveal how 1 Corinthians directly addresses the claims of unity and truth, church discipline, sexual matters, the Lord's supper, the nature of love, Christian leadership, and many other significant topics. Those who preach and teach 1 Corinthians will be grateful to Ciampa and Rosner for years to come and scholars will be challenged to see this letter with fresh eyes. In this lively, fluent commentary, James Edwards shows how Luke's vocabulary, historical background, special themes, and narrative purpose make his gospel unique. Edwards balances the axiom of Luke's Gentile focus by highlighting an overarching interest in the fulfilment of Jewish scripture. 859 pages, from Apollos. Douglas Moo's excellent, accessible commentary on these two Pauline letters evaluates the merits of plausible constructed 'backgrounds', combines exegesis with sound practical insight, balances scholarship with pastoral concern, and applies the meaning of the texts powerfully to twenty-first century readers. Exhibiting the same brilliant exegesis and sound practical insight found in his previous works, noted commentator Douglas J. Moo in this new volume not only explains accurately the meaning of the letters to the Colossians and to Philemon but also applies that meaning powerfully to twenty-first-century readers. Moo both interacts with the Greek text of these letters and clearly explains the English text to a contemporary audience. Informed, evangelical, methodologically astute, and displaying a careful balance between good scholarship and pastoral concern --- earmarks of the Pillar New Testament Commentary series as a whole --- Moo's Letters to the Colossians and to Philemon will offer insights to a wide range of readers, from teachers and students, to pastors and parishioners, to scholars and laypersons.